Direct access to original papers by doi (digital object identifier) . The global systematics of primitive arc melts. We extracted all volcanic arc rock analyses calculated to be in equilibrium with mantle olivine from the global georoc database. These results in 938 primitive melt compositions from 30 arcs. Based on geochemical criteria six principal types of primitive arc melts can be distinguished: calc-alkaline basalts and andesites, tholeiitic basalts, highly depleted tholeiitic andesites, shoshonites and low-Si basalts. Their major element systematics indicates that last mantle equilibration occurred mostly at 1.0–2.5 GPa, 1220–1350°C for tholeiitic and calc-alkaline basalts, at 0.5–1.2 GPa and 1200°C for depleted tholeiitic andesites, and at 0.7–1.2 GPa, 1050–1150°C for calc-alkaline andesites. 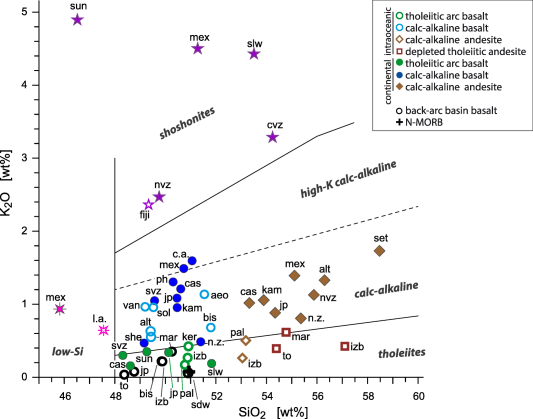 Quantitative treatment of major and trace elements suggests that the different melt types can be explained by a combination of variable mantle wedge preconditioning (degree of depletion prior to slab component addition, metasomatism in the lithosphere), variation in the amount and nature of the slab component added, and - for primitive calc-alkaline andesites - reactive fractionation in the lithospheric top of the mantle wedge. The different slab components are best characterized by high Na2O, TiO2, Zr and Th for slab melts; high K2O/Na2O and more pronounced Nb, Sr, and Pb anomalies for fluids; and high K2O at high K2O/Na2O for supercritical liquids. A slab component that is dominantly a slab melt is common in continental but rare in intra-oceanic arcs, consistent with comparatively cooler slabs in intra-oceanic subduction zones. A majority of the arcs has more than one melt type, testifying for heterogeneity in the mantle wedge and added slab component. SiO2-K2O diagram with fields after LeMaitre et al. and Rickwood  distinguishing the different primitive arc melt series, namely tholeiitic basalts (green circles), depleted tholeiitic andesites (dark reddish brown squares), calc-alkaline basalts (blue circles) and andesites (ocher brown diamonds), shoshonites (lilac stars) and low-Si basalts (pink crossed stars). Open symbols: intra-oceanic arcs, closed symbols: continental arcs. Black circles: back-arc basin basalts. Cross: average MORB.